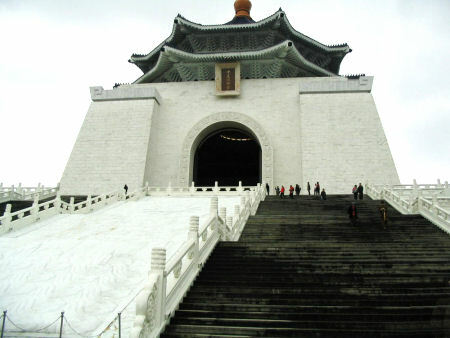 Taiwan is not high the Asian travel itinerary of most people. Having just spent a week there, I can recommend it as an interesting, friendly place to visit. You can see all the pix in the Taiwan Gallery. 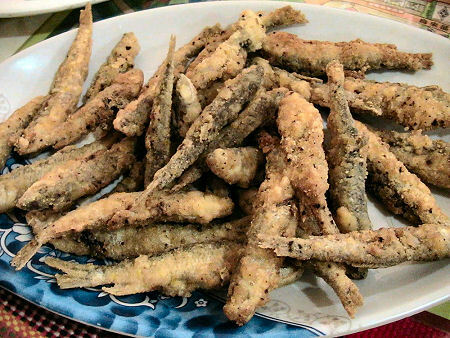 We flew for 4.5 hours, sardine-style, in a Jetstar Asia flight from Singapore to Taipei. Okay, the price was good, so I shouldn't complain about Low Cost Carriers. And it was cold - the first day was 11°C and the second was 8°C. Cold weather is one thing, but it seemed that nothing was heated. Our hotel room was very cold, the bus to Sun Moon Lake was frigid (the locals wore heavy coats - they knew what to expect), and the hotel in Sun Moon Lake was not heated. This is all good for energy efficiency, but for those of us who are cold-blooded reptiles, it was a shock. The National Palace Museum is a must-see. 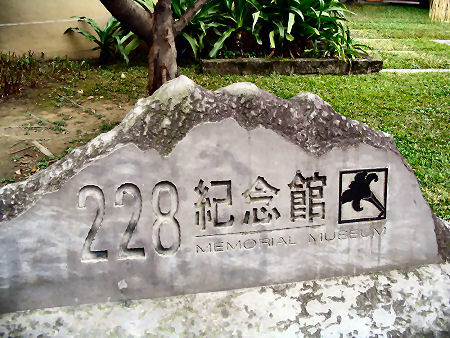 The museum houses the vast collection of items (around 700,000 artefacts) that the Kuomintang rescued (or stole, depending on your point of view) from the mainland as they fled the communists in the late 1940s. The enthusiasm of worshippers in Longshan Temple was striking. 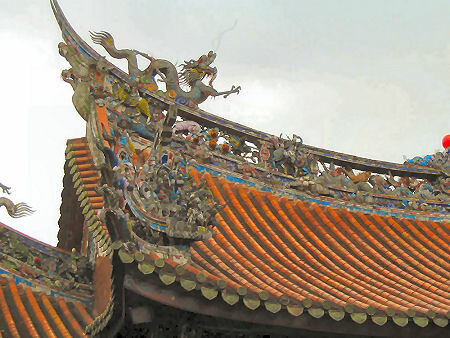 The Taiwanese have a plethora of gods that are worshipped next to each other in these temples. The events that are commemorated in the 228 Memorial Museum are quite shocking. After the victory of WWII, the Taiwanese had high hopes for the re-instated KMT government. But things did not go so well. Following a trivial misdemeanor (selling tobacco illegally), an old lady was pistol whipped. A protest ensued and one of the protesters was shot by police. Rioting broke out the next day, February 28, 1947 (hence "228") across the country. In an attempt to quell the rioting, the mainland sent in troops. What followed was a bloodbath - up to 30,000 people died as a result. The curious thing was that the incident was a taboo topic for almost 50 years. When Chen Shui-ban was elected mayor of Taipei, he promised to recognise the events of 228. This museum is a result. 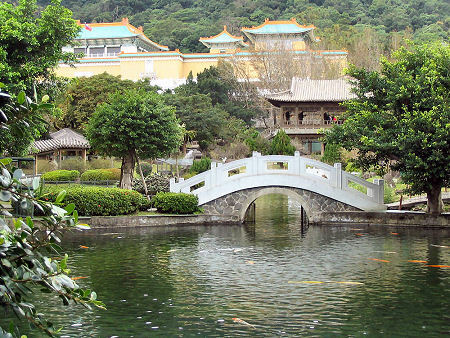 Taiwan lies on the Pacific "ring of fire" so earthquakes, volcanoes and hot springs are common. 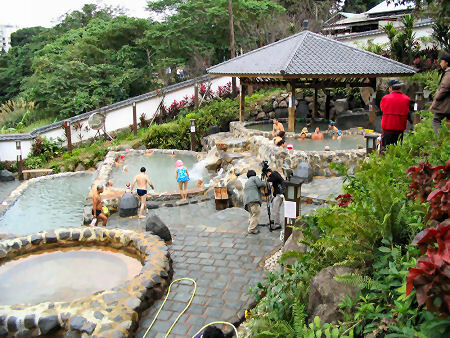 This is a public hotspring at Beitou, to the north of Taipei, reachable by MRT (the underground). We went up to Sun Moon Lake, in the centre of Taiwan. 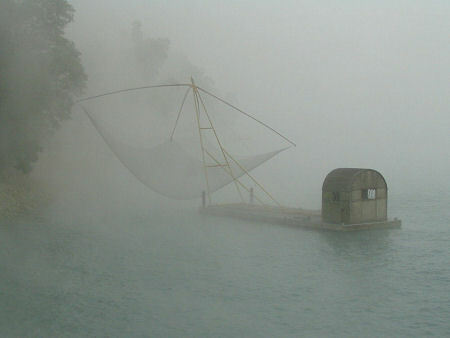 It was a 4.5 hour bus ride (that was cold) and when we arrived, the lake was totally fog bound. But it was nice and eerie. The next day we saw the sun for an hour or so - the only time in the whole week we were there. 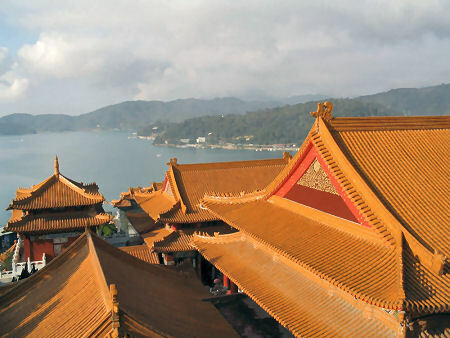 This is Wen Wu Temple, Sun Moon Lake. 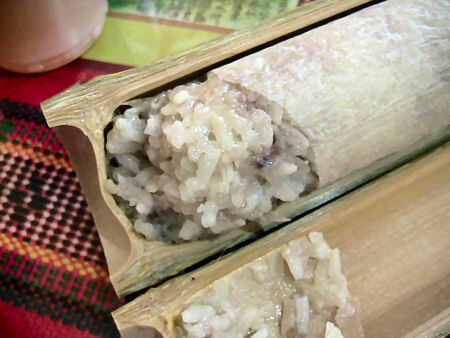 Taiwan has many aboriginal groups. 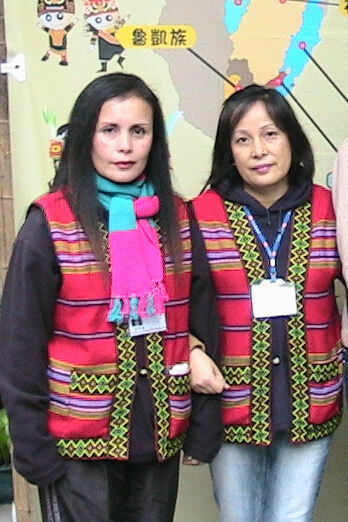 These are Atayal people in the Wulai district. In Atayal tradition, a woman's value is determined by how well she weaves. 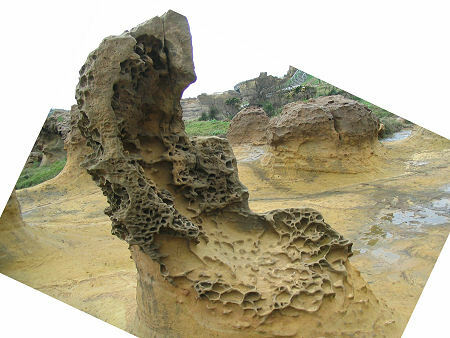 There is a scenic area to the north of Taipei called Yeliu, containing fantastic rock formations.This place would make a great movie location. We also went up to Yangming Shan, the mountains to the north of Taipei. We got spectacular views for the first 30 minutes or so, then the fog rolled in. 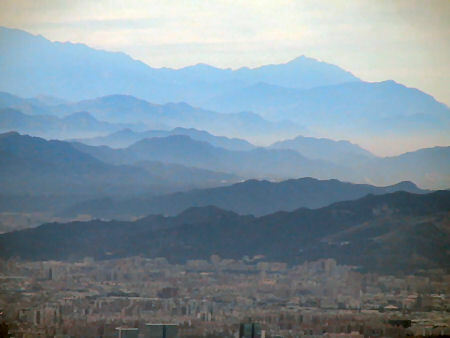 This is Taipei (at the bottom of the picture) from Yangming Shan, looking like a traditional Chinese painting. So I recommend Taiwan as a destination. It feels a lot like Japan, has a lot of Japanese food, is friendly like Japan, but is a lot cheaper than going to Japan. It is interesting culturally, historically and geographically, not to mention politically. Could you ask for a more serious identity crisis than this? A country that is not a country, intricately tied to the mainland (Taiwanese have billions of dollars of investments on the mainland), desperate for recognition, successful from a manufacturing and high-tech point of view and yet, they are in an uncomfortable limbo without recognition by most of the world. Oh, and facing a rapid military buildup from the mainland must be disconcerting. Go see it while the status quo holds. 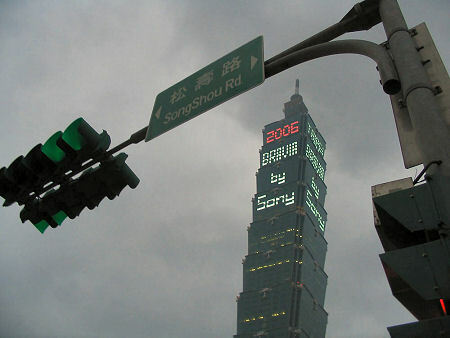 Go here for the Taiwan photo gallery. Love your shot of Yangming Shan M!